One of the many oddities of the Mexican Gray Wolf Recovery Program is that only about 40 wolves live in the wild but 300 are in captivity waiting for release. The Wolf Conservation Center in posh Westchester County has 24 lobos–more than Catroun County, NM, the ground zero of the anti-wolf movement. My husband David and I went up to see the wolves for one of their wine and cheese dusk howls. Next week I get to go out west and try to see them in the wild. You learn a bit about wolves, have a drink at dusk and see the wolves in their giant pens. We only got a good look at two wolves, what they call the ambassador wolves. Atka, 8, and Kaila, 15, are like show wolves. They’re quite personable and attuned to people. 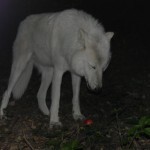 Atka in particular, an elegant arctic wolf, jumped around to chicken thrown to him. “He’s our best wolf ambassador, but he’s our worst wolf,” says Maggie Howell. He’s easily handled (though never by the public), so he can travel to schools and presentations. At the howl, he hammed it up for the crowd, pacing, jumping for chicken and howling when the crowd howled for him. At the opposite end of the spectrum and the Mexican wolves. Just before dusk we heard wolves howl in the distance. Spencer Wilhelm, who lead our tour, knew exactly which wolves were howling. Mostly it was the Mexican wolves, sometimes the red (which are also endangered and being reintroduced in North Carolina). Sometimes we’d hear a little intra-pack skirmish. That’s a big contrast to how wolf opponents describe the Mexican wolves: alternately as vicious, child-eating predators or as tame, hand-raised canines that can’t help but eat cattle. ) Our crowd–maybe 40 people, some families, some couples–sipping wine, laughing at Sarah Palin–is probably exactly what ranchers out west picture when they think of wolf supporters. I’m heading out to Albuquerque today, Tuesday, hoping to get to see some Mexican gray wolves. And maybe learn how to spell Albuquerque.